The 35th annual Cabin Fever Car Show in Knoxville, Tennessee (January 11-13) played host over the weekend to some of the coolest Fords East Tennessee had to offer. 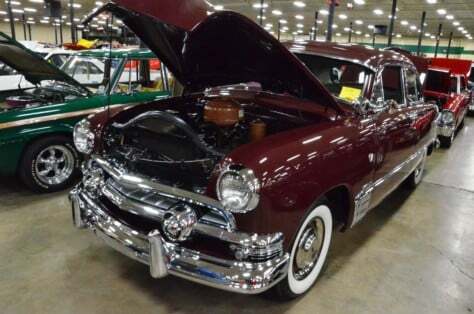 Shaking off the proverbial “cabin fever” is exactly what several dozen proud Ford owners did as they brought their rides out for everyone to see at the Knoxville Expo Center, the host of the Cabin Fever car show. Mr. Shelby would have been proud as some of his handy work was on display front and center at the show. Even in "kit" form, this was quite a group of Shelbys. Tony Lewis had his sinister looking black #1 Shelby Cobra on display along with his #15 Daytona Coupe. Butch Capps had his #146 Cobra on display while Jason Lowery showed off his more traditional street version of the Shelby Cobra. One of the cool things about the Cabin Fever show is the fact that not only does it feature a huge selection of show cars, it also features a very nice swap meet and car corral. If a "new to you" Ford is what you were looking for, well there were plenty to choose from! From Rancheros to Galaxies to Fox-body Mustangs and everything in between, a dozen or so cool Fords were parked throughout the car corral. If we had to pick one favorite of the event, it would have to be Judy Rollins' 1964 Ford Falcon Futura known as the "Phantom Falcon." In a world that consist of builds with endless budgets, this car has a nice mix of readily available '90s Ford parts creating a modern but simple cruiser. We especially liked the sweet Ford Motorsports intake manifold sitting atop the 1999 Ford Explorer 5.0L. Great job on the build Judy!